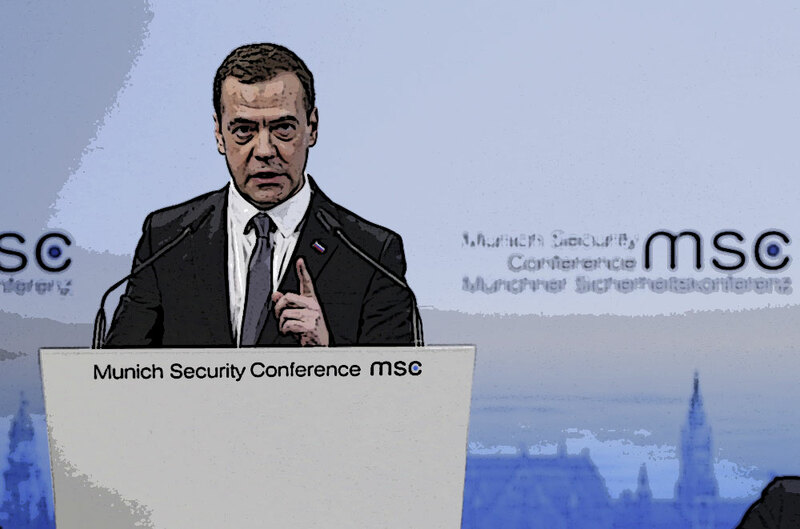 At the Munich Security Conference, Russian Prime Minister Dmitry Medvedev in his address openly spoke of relations between Russia and the West in terms of a new “Cold War.” Dialogue between them is now looking increasingly like a rhetorical war of attrition, with neither side on the offensive but neither willing to retreat either. Moscow does not want to slip further into confrontation with the West. The very fact that the Russian delegation at the Munich Security Conference on February 13 was headed by the country’s second most senior official, Prime Minister Dmitry Medvedev, is another confirmation of precisely that. On the other hand, Medvedev’s speech did not contain anything that could be interpreted as a step towards the West by way of a concession on Russia’s part. Instead, it was an affirmation of Moscow’s already stated positions on the main issues: the Ukrainian settlement, relations with NATO and the European Union, and familiar common threats, particularly terrorism. This dialogue appears more like rhetorical trench warfare, in which no-one is mounting any offensives any more, but is unwilling to retreat either. Because terms of a new world have not been agreed upon and are unclear, except for the fact that things will not be the same again. The talk that relations have either already slipped into a new “Cold War” or that there is still a chance of avoiding it has been a constant feature of the past two years. According to Medvedev, relations with NATO rather than the West as a whole have slipped back into a “Cold War.” Over the past several months, the situation in some areas has deteriorated still further, with new challenges and threats emerging. These require dialogue and coordination. The word “dialogue” is willingly used in the West too. They keep saying that a number of problems cannot be resolved without a dialogue with Russia. However, these remain just empty words. There is no talk of lifting Western sanctions imposed against Moscow, despite the fact that they have proven useless from the point of view of trying to “bend” the Russian regime. Apparently unexpectedly, Medvedev’s speech contained a passage devoted to European problems, in which he spoke of “the threat of Europe losing its identity.” He was primarily referring to the migrant crisis. However, Russia, whose media are paying a lot of attention to Europe’s migration problems, considers it very important to assert a principle of international relations that would rule out attempts to replace unwanted regimes through outside interference. This is one of the essential conditions for it to resume a wider dialogue with the West. The West’s cooperation with Russia in certain areas; the Syrian settlement or the global fight against terrorism; is being combined with attempts to “deter” Russia in other strategic areas. Moscow sees this as the main obstacle on the path of searching for compromises “on specifics,” like Syria. Simultaneously, in a “friendly gesture” to Medvedev at the Munich conference, NATO Secretary-General (Jens) Stoltenberg said the alliance was ready to resume the work of the Russia-NATO Council (suspended after Crimea joined Russia). Yet this is happening only after Moscow has shown its ability to effectively use military force in Syria, where government troops have managed to make considerable gains, because of the Russian airstrikes. Things are pretty much back to what they were during the Cold War: Everybody loves talking about peace and cooperation, but in reality getting down to dialogue only after the other side starts bombing somebody heavily and there is a strong smell of a big war in the air. There are figures in Russia with far harsher rhetoric than Dmitry Medvedev who could openly raise the issue of such a threat.